For transpersonal research, an individual researcher’s personal beliefs and cultural meta-narratives become even more problematic. For example, most people who have had spiritual experiences know that these experiences and their impact on spiritual development are not lawful in the sense of what lawfulness means in human terms. The impact is certainly not lawful in the mechanistic Cartesian terms common in the West. Yet, the challenge is deeper for transpersonal research than human science research generally because the Sacred may be inherently spontaneous and indeterminate, resulting in spiritual experiences and their impact as completely outside our understanding – at least in words and concepts. Acknowledging that our research topics and participants represent the Sacred – each in their own ways – and might be trying to get through to us. References: Thomas, W. I. (1923). The unadjusted girl: With cases and standpoint for behaviour analysis. Boston: Little, Brown & Company. Bio: Rosemarie Anderson, PhD, is Professor Emerita of Transpersonal Psychology at Sofia University, USA. Currently, she is Co-Founder and Co-Director of the Transpersonal Research Network and the Sacred Science Circle; serves on the Editorial Boards of the Journal of Transpersonal Research, Journal of Transpersonal Psychology, Qualitative Psychology, and The Humanistic Psychologist, and teaches transformative approaches to research worldwide. Together with the late William Braud, she has co-authored Transpersonal Research Methods for the Social Sciences, the book that established the field of transpersonal research methods in 1998, and Transforming Self and Others Through Research in 2011. With several others, she co-authored Five Ways of Doing Qualitative Research in 2011. She has recently completed a translation of Lao Tzu’s Tao Te Ching based on her knowledge of Chinese acquired in the late 1970s. In August 2017, Rosemarie will be formally awarded the Abraham Maslow Heritage Award for her “outstanding and lasting contribution to the exploration of the farther reaches of the human spirit” by Division 32, Society for Humanistic Psychology, of the American Psychological Association. Researchers involvement into the field under investigation has always been a factor to be considered. In empirical approaches standardization of measurements methods and double-blind techniques are good ways to avoid or at least limit researchers’ influences. In qualitative research methodologies, this is much more complicated. Considering the transpersonal field if we want to investigate inner experiences the presence of the researcher cannot be avoided at all. I think that esoteric and wisdom traditions can be helpful to prepare the researcher, strengthen his/her self-awareness and ability to master inner processes. In my experience mindfulness practices (in the most inclusive sense of the word) were very important in every phase of research. Starting from the research question through data collection and analysis to the final discussion. In qualitative research, we do not have a direct question linked to a causative effect, rather we deal with a broad field of experience to be described. How do we focus this field? Self-reflective practices are very often used for these purposes. Sometimes I used shamanic journeys to go more deeply into the self, looking for the Question that might be guiding unconsciously both personal and professional lives, almost leading the researcher into that specific field. Collecting data about inner experiences is very close to a heuristic process. To be deeply connected with our inner self and with the field under investigation is of absolute importance and again mindfulness practices are very helpful. When it comes to data analysis phenomenological approaches require what is called epoche. This is a process necessary at a mental level, I would say that a deeper level of self-awareness is necessary and can be obtained only through a transformative practice involving also the spiritual level. I think that every research practice has a transformative potential both on the researcher and the field under investigation. This is even truer in transpersonal research. I would like to invite discussant of this section to deepen the role of esoteric and wisdom traditions not as a simple method of investigation but as an instrument of transformation during the research process. Bio: Giovanna Calabrese, M.D., Ph.D., D. Psy. She has a background in brain imaging research applied to neuropsychiatric diseases. In the last 10 years she moved towards transpersonal psychotherapy, combining clinical practice and academic activity using qualitative approach to research in the transpersonal field. She teaches at the Integral Transpersonal Institute in Milan, Italy; is Editor of Integral Transpersonal Journal; founder of the Eurotas Division Transpersonal Research. An embodied approach to phenomenological transpersonal research includes the whole process of data collection, data analysis and the communication of research findings. In addition to standard phenomenological data analysis procedures, complementary methods that acknowledge alternative ways of knowing and expressing research findings may help to “give voice” to layers of embodied understanding in the sense of “living sacred texts”. The use of Renga, a Japanese form of collective poetry, for kindling audience participation during the presentation of research findings, developed by Galvin and Todres (2012), will be outlined as an exemplar of a non-linear collective poetic form of expression. Hess is currently developing this approach further by intertwining it with the transcultural spiritual practice of walking meditation in a sacred circle to enhance tactile-kinaesthetic and tacit experiences while evoking the collective poetry – so that it can become a walking poetry or living sacred text. Drawing on insights from Maxine Sheets-Johnstone’s ‘primacy of movement’, this spiritual movement practice can be a simple and universally applicable method for developing connectedness and awareness and thus enhancing even further the shared tactile and tacit embodied understanding to be achieved by a participatory audience. The central concept in embodied phenomenology is ‘embodied understanding’ seen as a place where being and knowing meet. It emphasizes on the implicit aspect “the more than words can say.” The implicit carries the spiritual, the mystic, the mystery and wonder by accessing non-ordinary states of consciousness. It is a non-linear experience, like listening to music—where the experience is much more than the individual notes. In addition to turning research findings into “living sacred texts”, a further aim of such evocative forms of disseminating scientific knowledge is to enhance its social impact such as in educational settings or by reaching out to a wider general and thus participatory public. Bio: Regina U. Hess, PhD, is a clinical psychologist and a transpersonal body psychotherapist (Germany), and holds a PhD in transpersonal psychology (USA/UK). She is a researcher, writer, and international speaker, and works with arts and film. Regina is the founder of the Ase World Forum for the investigation of ancient transcultural healing modalities and their integration into modern transpersonal interventions and research. She specializes in shamanic traditions, spiritual paths, the use of altered states of consciousness for healing, and transcultural research. She has extensive experience in humanitarian field work and field research in Europe, India, Nepal, Africa, and USA and Mexico. Regina a core member at the International Institute for Consciousness Exploration and Psychotherapy, Freiburg, Germany, and is faculty at other international educational institutes. She is a member of the editorial board at the Integral Transpersonal Journal and the ‘Forum Qualitative Social Research.’ Regina is on the Board of Directors of the European Transpersonal Association and of the International Transpersonal Association, and is co-founder of the Transpersonal Research Network. She co-organizes the annual Transpersonal Research Colloquium. Regina is a member of the Swiss Medical Society for Psycholytic Therapy. Her articles have appeared in numerous international journals, and she is the co-editor of and a contributor to various books. The Scientific Method Depends on Theories, Hypotheses, and Research: Scientific inquiry relies on objective methods and empirical evidence to answer testable questions. Interconnected ideas or models of behavior (theories) yield testable predictions (hypotheses), which are tested in a systematic way (research) by collecting and evaluating evidence (data). What is missing for an ITI? Theory: The World is as you dream it. Who is the dreamer, which dream are you dreaming? how are you dreaming? Theory is a contemplation of the world. What do you choose to contemplate? Which eyes are you using? ITI offers the ways to purify the intent (Ceremony of the Intent), tools to purify your perception of the world (Organismic Constellation), ways to purify your eyes (Integral Transpersonal Thinking). Hypotheses: Integral means not touched, to have an integral experience of the world you should don’t not touch anything. ITI suggests just to be aware of your beliefs and Hypotheses and forget about them. Bring your intent that is coming directly from the Self and verified by the Ceremony of the Intent. To “contemplate” data from without and from within and from the field all around (through Second Attention Epistemology). To apply the finding in a dynamic and circular dialogue between maps and territory. to explain (why) behavior and mental activity. Bio: Pier Luigi Lattuada of the Integral Transpersonal Institute, Milan, Italy and Sofia University Palo Alto Ca is a Medical Doctor. He has a Ph. D. in Behavioral Studies and a Psy. D. in Clinical Psychology. He is also a Psychotherapist. Founder of Biotransenergetics, Pier Luigi is the Director of the Transpersonal Psychotherapy School in Milan, which has been fully recognized by the Ministry of Education University and Research since 2002. He is also director of the Training in Transpersonal Counseling accredited by AssoCounseling. He is Adjunct Faculty at Sofia University, Palo Alto, CA and Faculty and chair of BA on Integral Transpersonal Psychology at Ubiquity University. Many spiritual traditions incorporate systems of embodied movement that integrate with the tradition’s spiritual and mystical teachings, and promote transformation. Over a period of several years, I have been working in a group to develop a series of movements that might embody the teachings associated with the Hebrew letters. In view of their status as “divine agents”, the letters take on meaning beyond that of arbitrary signs in all branches of Jewish teaching, and play a major role in the mystical tradition. In the words of one of the most influential kabbalists, Abulafia (1240- after 1291), “The letters are without any doubt the root of all wisdom and knowledge, and they are found at the core of prophetic consciousness….” Entire mystical manuals are devoted to the nuances to be found in the letters’ shapes, the meanings of their names, and their numerical significances. The primary aim has been to perpetuate a traditional set of teachings in a more contemporary guise, thereby sharing beyond a specific ethno-cultural tradition. Thus, for example, many who are unable to engage with Hebrew language mysticism due to not knowing the language, may find value in this derivative movement system. Of specific relevance to the aims of this TRC is the embodied hermeneutic method practiced within our work. Whilst translating meaning into movement was the initiating impulse, it has become clear that the whole process through which movement emerges has enriched experience of the teachings associated with the letters. Experiential hermeneutics is central to the Kabbalah and many mystical traditions. My presentation will explore ways in which embodied movement has the potential to further the hermeneutic method and promote two goals of transpersonal methods—facilitating transformation and exploring the conditions under which psycho-spiritual processes unfold. Bio: Les Lancaster is Professor Emeritus of Transpersonal Psychology at Liverpool John Moores University, UK and an Honorary Research Fellow in the Centre for Jewish Studies at Manchester University, UK. He is past Chair of the Transpersonal Psychology Section of the British Psychological Society, and currently President of the Board of the International Transpersonal Association. Les’ research interests focus on the cognitive neuroscience of consciousness and the psychology of mysticism, with a specific focus on Kabbalistic Psychology. His initial research training was in neuroscience and psychology, and over some forty years he has developed expertise in the hermeneutic methods employed in the rabbinic and mystical traditions in Judaism. His ongoing challenge is to find ways to integrate these two methodological strands to the benefit of transpersonal psychology. In addition to many journal articles, Les’ published works include Mind Brain and Human Potential, winner of a Science and Medical Network Best Book Award, Approaches to Consciousness: The Marriage of Science and Mysticism, and The Essence of Kabbalah. Abstract: Jessica’s research pursuits focus on the intersections of transpersonal psychology with mental health, performance studies, martial arts and ritual arts. Jessica has a PhD in Psychology; in her research, she explored “Theatre as a Transformative Practice,” examining the actor’s craft as a vehicle for ‘work on the self,’ focusing on contemporary theatre practitioners in Europe and the USA who combine esoteric practices (e.g. in the Gurdjieffian tradition) with physical theatre and traditional song work. Alongside immersion in such practices, Jessica has for the last decade been working in the arena of mental health, leading an ‘arts on prescription’ service in the UK – Creative Alternatives -catering for adults with depression, stress and anxiety. This dual exposure to ritual arts and therapeutic arts has afforded her the opportunity to pursue intensive practice-as-research, exploring the transformative potential of creative self-expression in those contexts and examining the boundaries between participatory arts, the arts therapies, and ritual arts, considering the skills and training needed to facilitate such work, as well as what support and working conditions need to be in place to ensure safe practice. In line with the 2017 TRC theme, Jessica’s contribution will focus on using embodied arts practices for research. More specifically, Jessica will bring examples of practice pathways which involve theatrical rituals, featuring spontaneous movement and vocal work for deep imaginal and embodied research of archetypal themes. Jessica will highlight how such work may serve the development and growth of an individual, as well as being of service more widely as ritual structures and techniques are adapted for different contexts. Bio: Jessica Bockler is an Applied Theatre practitioner and Transpersonal Psychologist with a passionate interest in expressive & ritual arts as a way to meaningful living. Jessica is director of Creative Alternatives (www.creativealternatives.org.uk), an arts and mental health service which operates in Merseyside, UK. Jessica is also co-founding director of the Alef Trust (www.aleftrust.org), a global transformative learning provider which offers postgraduate education programs and community programs, promoting holistic psychological frameworks and perspectives, nurturing the development of human consciousness and culture. Jessica has a BA (Hons) in Performing Arts (Acting, Community) from the Liverpool Institute for Performing Arts, and an MSc in Transpersonal Psychology and PhD in Psychology from Liverpool John Moores University. In her PhD research, she explored “Theatre as a Transformative Practice,” examining the actor’s craft as a vehicle for (trans)personal growth and development, focusing in particular on contemporary theatre practitioners and companies whose work has been inspired and influenced by the Polish theatre master Jerzy Grotowski who for decades explored the convergence and divergence of theatre and spiritual ritual practices. Jessica is also a Sesame Practitioner, trained by Sesame Institute, London, in the use of story, drama and movement as a vehicle to work with Soul. Jessica has extensive experience of creative program management and multi-modal arts facilitation in community, education and health contexts and she specializes in transpersonal and somatic approaches to creative practice, combining expressive drama and dance work with practices enhancing mindfulness and body awareness. about my personal transformation. Thus, the high-point of the existing text can be seen as a gateway to a whole new way of conducting my own research. Bio: Shawn Bryant, PhD, is a member of the core faculty of the MA program in Peace, Development, Security, and International Conflict Transformation at Innsbruck University, Austria and holds a PhD in International Peace, Conflict and Development Studies from the Universitat Jaume I in Castellón, Spain. He resides in his hometown of Nanaimo on the west coast of Canada, where he is involved in body-based treatment of trauma and addictions through the practice of a Lakota-style sweat lodge, yoga, and aikido. Researchers who study yoga and mindfulness for children typically use quantitative research methods to focus on the potential psychosocial benefits of these interventions. For example, several studies suggest that school-based yoga and mindfulness may have beneficial effects on students’ mental health and self-regulation. However, some studies have found counter-intuitive or null effects of school-based yoga and mindfulness, such as increases in student self-reports of negative affect and perceived stress. These inconsistent findings suggest that alternative research methods are needed to elucidate the complex effects of these interventions on children. project through the lens of transpersonal research methods. I will provide examples of several ways in which the research methods of the project could have been restructured in order to more specifically address the transformational potential of yoga and mindfulness for youth as well as the researchers and intervention instructors who were involved in the study. I will also address the potential for yoga and mindfulness to serve as research methods in and of themselves, both for the student participants and the researchers. I will conclude by describing how transpersonal research methods may help researchers, participants, and consumers more appropriately study the complex effects of yoga and mindfulness for youth. Bio: Bethany Butzer is an author, speaker, researcher and yoga teacher who received her Ph.D. in psychology in 2008 from the University of Western Ontario, Canada. Her early research focused on anxiety and depression, however after receiving her Master degree she changed her focus to positive psychology, which emphasizes the development of human strength and potential. Her dissertation research on the psychology of romantic relationships garnered the Martin E. P. Seligman Award for Outstanding Dissertation Research in Positive Psychology. Bethany has worked in the corporate world and in academia, and she has also spent several years as an entrepreneur. Bethany is a certified yoga teacher and has completed over 200 hours of training in yoga postures, philosophy, breathing techniques, meditation, anatomy, and Ayurveda. In 2010 Bethany published her first book, The Antidepressant Antidote: Five Steps to Get Off Antidepressants Safely and Effectively. In addition to her book, she has published academic papers in several leading psychological journals, including Personality and Social Psychology Bulletin and Personal Relationships. From 2013 to 2015 she was a postdoctoral research fellow at Brigham and Women’s Hospital, Harvard Medical School, where she studied the effects of yoga in school settings in collaboration with the Kripalu Center for Yoga & Health. Bethany currently lives in Prague, where she teaches an undergraduate positive psychology course at the University of New York in Prague and continues to study yoga and mindfulness for youth. I have been practicing seated meditation on the daily basis for about 30 years. Each session of practice is ritualized in some way and constantly changing in another sense. It is ritualized in the way that invariably I would sit on a soft cushion with my legs crossed (known as full lotus position), spine straightened in line with the neck, hands folded with palms up placed on the crossed legs in front of abdomen. After the physical posture is settled, relaxed and stable, I move to the second stage of practice: observing my breathing in and out and the sojourn between inhaling and exhaling. In this process of breath watching, physical sensations, fluctuating emotions and discursive thoughts emerge. The part of I that is watching stays open to the parts of me that are emerging into consciousness and being observed. External sounds may also enter and being observed (heard). The third stage I go through, not necessarily in a rigid sequence (it could appear spontaneously any time), is the merging of the watching I and the watched me (objects of observation). The merge highlights the whole seated meditation and brings joy, ecstasy and equanimity or pure consciousness. The practice is a research method itself because whatever phenomenon that manifests in the whole practice registers as and becomes part of the narration during and after the practice. The post-meditation narrative might not be able to recall all the phenomena per se but should be able to recapitulate the significant experiences, physical, emotional, cognitive and imagistic. Such a first-person narrative is impossible by mechanistic observations of EEG, MRI, fMRI or by mixed method of qualitative and quantitative methods. Moreover, this research method not only narrates what is happening and observed in my inner cosmos and how I respond to the external stimuli, but also narrates the mystic phenomenon of the merging of observer and the observed in all its variety and entirety. Through Jevon’s experience with open awareness in the contexts of training, as well as in coaching and therapy, he is convinced that this mindfulness based approach can be of value to transpersonal researchers, as outlined in this abstract. Open awareness (OA) is a particular mode of perception in which individuals are attentive to both their own thoughts and feelings as well as those of others, including the context that connects them. It is a type of attention that is close to being simultaneously inward and outward focused, thereby making one more conscious of the interrelatedness of phenomena. The earliest tracings of OA appear to stem from Buddhist origins and it was possibly first introduced in the West through the teachings of Gurdjieff in the early nineteen hundred. The process of OA reframes one’s current experience of self, placing phenomena within one’s field of awareness, as opposed to these being experienced outside or separate from oneself. OA involves the intentional observation of one’s thoughts, feelings and sensory perceptions in the present through opening the aperture of one’s awareness. This type of opening is facilitated by means of expanding one’s mode of perception to include the aspects of each unfolding experience that usually occur in or beyond the outskirts of conscious awareness and which are therefore usually unconscious or disregarded. In addition to identifying the subtleties of one’s internal experience, OA includes becoming receptive to the energetic and relational links between oneself and others and the environment. In OA, the experience of Self fluctuates and is therefore not an ultimate state, but rather one in which the person experiences a felt sense of expansiveness and interconnection as a result of dis-identification from their individual self-concept. This TRC presentation/session will be highly experiential in order for those present to get a good taste of the various ways in which OA can be established. Suggestions will be made as to how OA might enhance existing transpersonal research methodologies and discussions welcomed. Research is an organic process that has its conception well before data gathering begins. It is not just the process of gleaning information from books and scholarly papers. It is a way of being part of the living field of the research. In my dissertation, An Integral Inquiry into Prenatal Depression, Heart Math and Transformation, my own transformation was informed by a purposeful seeking of experience. This presentation will focus on preparation before research, especially as it applies in Integral Inquiry, and the importance of personal experience in the field being researched. The originator of Integral Inquiry, William Braud, placed emphasis on “the preparedness or adequateness of the researcher” (Braud,1998b). With that tenet in mind, I consciously prepared myself as the vessel from which my research would flow and take form. Inspiration came from the women of Tibet who prepare themselves physically and spiritually before inviting their babies into the womb. Trainings most beneficial to my process included Mindfulness Based Cognitive Therapy (MBCT) a method that taught me to form new relationships with old states of mind, and Yoga Nidra, known as sleep yoga, which challenged me to embrace and befriend my fears. Hypnotherapy took me on a journey to my own birth. A year of Qigong training taught me flow and centering. Heart Math provided a mechanism for measuring the effects of thought shifting and mindful breathing and cleared mind-space for contemplating information. Nurturing myself spiritually and physically was vital to my research. Braud (1998b) also encouraged expanding sources of inspiration to include among other elements, personal and anecdotal evidence. My personal experience of the phenomenon being researched created a frame for and guided my choice of questions while gathering biographical information in the qualitative research portion of my study. It also proved integral to organizing and categorizing important aspects of the data providing a depth of understanding, empathy and compassion as the lens through which I was able to experience my research. Bio: Pamela Dailey Poston, as an individual who has walked her life journey accompanied by depression and cancer, Pamela knows the value of the spiritual and its healing potential. Pamela has been in private practice for 17 years in Charlotte NC. After receiving a Master’s degree from the University of North Carolina, Charlotte in Community and Agency counseling, she began her career counseling children and adults with cancer. She had the opportunity and privilege to be involved in designing a center for education and counseling for cancer patients and their families. Pamela has trained in techniques such as EMDR, Family Systems Therapy, Mindfulness Based Cognitive Therapy, Yoga Nidra, Heart Math, and is a certified Qi gong Counselor and Heart Math practitioner. Pamela received her Ph.D.at Sofia University. Her dissertation, an Integral Inquiry into Prenatal Depression, Heart Math and Transformation required much of her as a researcher, which proved to be transformative in her personal and professional life. My aim in this presentation is to marry the old and the new by offering an experience of creative imagination and the union of opposites. The ‘old’ is in the form of the ancient practice of alchemy – as a metaphor for the process of psycho-spiritual transformation as illustrated in Michael Maier’s series of alchemical emblems (1618) and the ‘new’ in the form of the more recent neurological research into the right and left hemispheres of the brain published by Iain Mc Gilchrist (2007) in The Master and his Emissary. In my current PhD exploration of alchemy as a research methodology, I am following in the footsteps of Anderson and Braud’s (2011) development of transpersonal research methods that facilitate the transformation of self and others. The alchemical process is based on the experience of conjunction, a marriage or unification of opposites which leads to the birth of the philosophical child, or the evolution of consciousness. Through the use of creative imagination and contemplation of one of Maier’s emblems, I am proposing to guide participants in a short meditation to meet and get to know their current inner research relationship – to constellate the opposites and dialogue with them. Mc Gilchrist gave the keynote speech at this year’s UKCP conference at Regents University. I was inspired to see the reflection of the alchemical marriage in his work on re-uniting the hemispheres. It seems to me that these opposites as he described them correlate to the ‘masculine’ ego and the ‘feminine’ soul as depicted in Maier’s emblem. According to Mc Gilchrist the faculty of the human psyche that enables us to synthesis the two hemispheres of the brain is creative imagination – the key to building an essential bridge between the two. Here we have current neurological support for the use of creative imagination and the efficacy of the ancient practice of alchemy. addition she is the clinical lead supervisor at Help Counselling Centre, a charity based in Portobello, London. Debra is also a PhD student in her second year conducting research at CCCU (Canterbury Christ Church University). The title of her research is The Crone in the Crucible: An Alchemical Experience of Embodying the Wise Woman. Having studied and applied alchemy as a metaphor for the process of psycho-spiritual transformation for 20 years in her therapeutic practice, Debra is now exploring the application of the alchemical process as a transpersonal research method. The meaning of subjective experience in non-ordinary states of consciousness [NOSC] determines their personal value to the individual. Research into NOSC should include narrative reports from the perspective of Pure Awareness [PA], which is consciousness without content, also known as Pure Consciousness. The subjective meaning of narrative reports should serve to measure experience in the realms of human consciousness. Narrative experience gives non-ordinary states of consciousness meaning. This paper proposes that empirical categories, which are treated as objective data in psychological studies, are inadequate to categorize the personal import of NOSC. Patanjali’s Yoga Sutras, the Buddhist Visuddhimagga, and other wisdom traditions will be discussed as pre-existing models of research through PA. The biological developmental psychology test, Temperament Character Inventory, by C. Robert Cloninger, which measures personality developmental stages through the levels of Bodhisattva and Non-Dual states of PA, will be explored as a support to the proposition of PA as the measure of the meaning of all things conscious. OBJECTIVES: a) To propose the study of NOSC towards meaningful narrative data. b) To analyze methodologies of the research into the meaning of NOSC. Bio: James Eyerman: My introduction to transpersonal psychology began with a NDE at age 16 when my Karmann Ghia convertible hit an oil slick and flipped onto its roof. Then a monk, Thomas Merton, sent me a note “Read Jung and learn to meditate”. Krishnamurti gave me a taste of non-duality in The Only Revolution. Grof provided a western framework for my experiences in his psychotic therapy papers. My focus has been on transpersonal psychology, Ayurveda, Yoga, psychopharmacology, and Holotropic Breathwork. This presentation introduces two participatory transpersonal research programs based on spiritual practices: Embodied Spiritual Inquiry (ESI) and Entheogenic Collaborative Research (ECR). ESI is both a contemplative practice and a second-person approach to participatory learning, inquiry, and education. While contemplative approaches tend to be individually focused (contemplative practices) or to use presence/awareness exercises (contemplative pedagogies), ESI systematically engages contemplation through mindful physical contact among practitioners. This contact occurs at not only the verbal and awareness levels but also the somatic and energetic levels. Contemplation is thus applied as the very means of a multidimensional inquiry seeking to inter-subjectively access the epistemic power of all human attributes (e.g., body, vital world, heart, mind, and consciousness). ESI integrates essential elements of traditional contemplation, somatic psychology, contemporary integral transformative practices, the cooperative inquiry paradigm, and participatory spiritual approaches that stress the embodied, relational, and enactive (i.e., creative, inquiry-driven, and world-constituting) dimensions of spiritual knowing. ECR entails the intake of a visionary medicine—such as San Pedro (wachuma) or ayahuasca—by a team of researchers focusing their attention on the possible occurrence of external visions. Seeking to overcome the epistemic narcissism and colonialism intrinsic to much Western psychological research, ECR could be also developed in partnership with traditional practitioners such as shamans or healers. At a first stage (preparation), coresearchers agree to contrast their perceptions both during and after ceremonies while being mindful of peer-pressure influences, unconscious group collusion, and other potential methodological pitfalls. The second stage (journey) consists of the actual intake of the medicine and ensuing group visionary journey. At a third stage (internal comparison and interpretation), coresearchers contrast their experiences and search for intersubjective agreement in their visions. Were shared visions identified, coresearchers discuss their ontological nature from a pluralistic epistemological perspective that does not impose a priori metaphysical limits to the nature of the inquiry outcomes. Multiple methodological standpoints, epistemologies, and metaphysical frameworks are considered to discern the more appropriate account of the perceived phenomena. At a final stage (external comparison and re-interpretation), coresearchers look for contrasts between the group’s inquiry outcomes and available Western and non-Western literature about the meaning and ontological nature of the identified shared visions. Bio: Jorge N. Ferrer, Ph.D., is core faculty in the departments of East-West Psychology (EWP) and Integral and Transpersonal Psychologies (ITP; online) at the California Institute of Integral Studies (CIIS), San Francisco. Formerly the chair of the EWP department, he is the author of Revisioning Transpersonal Theory: A Participatory Vision of Human Spirituality (SUNY Press, 2002) and Participation and the Mystery: Transpersonal Essays in Psychology, Education, and Religion (SUNY Press, 2017), as well as the coeditor of The Participatory Turn: Spirituality, Mysticism, Religious Studies (SUNY Press, 2008). In 2009, he became an advisor to the organization Religions for Peace at the United Nations on a research project aimed at solving global interreligious conflict. He was born in Barcelona, Spain. Scientific research is an ongoing and reiterative process in which theories are constantly updated in light of new empirical findings, and these revised theories in turn spur the search for new empirical findings ad infinitum, resulting in a type of hermeneutic spiral that can lead to cumulative progress. Just as important as doing good research using theory construction and data collection is the need to challenge “not-so-good” research, and this applies to transpersonal psychology more than to other areas of scientific psychology, due to its many nonconventional constructs. The discipline of psychology is currently undergoing a severe crisis in confidence, as many of its most-accepted findings have been shown to be nonreplicable despite that replicability is the standard basis for holding confidence in any research claim. This crisis is eroding the most hard-science areas of psychology, such as neuroscience’s fMRI data that have been called voodoo findings, as well as the growing ridicule toward outrageous soft-science claims stemming from positive psychology, such as shown in the recent debunking of the so-called “critical positive ratio” by the presenter. These outrageous claims have been employed in many applications that have affected the credibility of clinical, counseling and organizational approaches. This presentation examines the scientific crisis within mainstream psychology, and explores its meaning for transpersonal psychology. Focus will be on the presenter’s recent debunking of several headline-grabbing claims related to transpersonal psychology, such as that loving-kindness meditation improves vagal-nerve signs of health and that eudemonic (i.e., altruistic, as opposed to hedonic) motivation relates to healthier genomic expression. The presentation ends with discussion on how to do responsible science using empirical research and theorizing within transpersonal psychology. In specific, the misuse of romanticism and scientism — and the unique blending of these resulting in “romantic scientism” are rejected as cultural traps. Along with rejecting these an argument is offered for substituting both “theories of everything” and “theories of nothing” with empirically accessible “mid-range theories,” which can successfully be explored using conventional scientific methods to research the nonconventional constructs that are the subject of transpersonal psychology’s interest. Bio: Harris Friedman, PhD, is retired Research Professor of Psychology at University of Florida, and Professor Emeritus of Humanistic and Transpersonal Psychology at Saybrook University and Distinguished Professor of Integral and Transpersonal Psychology at the California Institute of Integral Studies. He teaches on the core faculty at Goddard College, supervises dissertations at several universities, and practices clinical and organizational psychology. He has written extensively on transpersonal psychology, cultural change, and research methods. He has over 200 professional publications, many in top mainstream psychology and general science journals, and his recent books include Transcultural Competence (American Psychological Association, 2015), the Praeger Handbook of Social Justice and Psychology (3 volumes; 2014), and the Wiley-Blackwell Handbook of Transpersonal Psychology (2013). He is Associate Editor of both the Humanistic Psychologist and the Journal of Humanistic Psychology, as well as Senior Editor of the International Journal of Transpersonal Studies. He is now completing Transpersonal Psychology in Practice (2 volumes; Praeger). He is Life Member and Fellow in 6 American Psychological Association divisions, and recently received its Humanistic Psychology Division’s “Abraham Maslow Award” (“for an outstanding and lasting contribution to the exploration of the farther reaches of human spirit”). Ethical principles of research involving human participants are coded into guidelines such as the Declaration of Helsinki, the Belmont Report, and the ICH Good Clinical Practice (GCP). Research Ethics Committees must approve and monitor research as advocates for the rights, safety and well-being of research participants. Although the guidelines are equally relevant to qualitative as to quantitative methodologies, certain factors may complicate their application to the qualitative. This is especially true for transpersonal studies. The field of transpersonal psychology is relatively young, and best practice as applied to this unique field may be less developed and less debated. Research methods involving spiritual practices are by nature often participatory on a deep and existential level. The boundaries between research, therapy, and experiential outcome are blurred. Transpersonal and spiritual research are more likely to directly influence the participant in potentially unpredictable ways that may require specialized training and skills to manage in addition to research skills. Factors that complicate transpersonal research methodology include the more integrated and less objective relationship between the qualitative researcher and research participant, the complex and adaptive nature of the protocol methodology, and the potential psychological effects of the research on the participant. Are researchers adequately informed and prepared for the complexities? Do transpersonal research proposals adequately and pro-actively address risk and outcome? Research ethics committees (REC) require specialized knowledge and training to asses qualitative and transpersonal research.REC members need to be versed in the subject material, methodology, and have insight and experience into spiritual and bio-ethics. Are RECs that evaluate transpersonal proposals up to the challenge? Recognizing that the potential benefits of research should be balanced with pragmatically applied ethics, due consideration is required of these and related factors. Bio: Dr. Hennie Geldenhuys (M.B., Ch.B M.Fam.Med) is a medical doctor and specialist Family Physician with over 15 years of experience in academia and clinical research, ranging from clinical trials and quantitative research, to qualitative and mixed method methodologies. He is also a qualified Transpersonal Coach, Authentic Self-Empowerment (ASE) coach, and Master Hypnotherapist. He works with individual and group clients through his Integrated Health Practice in South Africa, and offers training courses and retreats. Hennie is a certified trainer of applied ethics and Good Clinical Practice (GCP) in research, and regularly conducts workshops and training courses for new and experienced researchers. The three main philosophical “dimensions”: Being – Knowing – Becoming, provide a basis for the different modes of functioning regarding: creation of new forms, knowledge of these forms, and creative being as such, and likewise how these modes of functioning are related. Combining this “tripod” with the esoteric planes of existence/of consciousness, will give us a means for talking about the different activities aimed at experiencing and finding new insights and knowledge within the Transpersonal field. Fundamental in the esoteric world picture, in what is called “the Ageless Wisdom” and Theosophy, are the Seven Planes, ranging from the densest plane, where embodied living takes place, to the highest, most subtle plane of spiritual or “divine” energetic group being, where existence and consciousness are all-encompassing, makes a useful conceptual staircase for human development and after. Each of these seven planes have seven sub-planes, making all-together 49 planes, where the lower half – at least – would be meaningful to the theme of the 2017 TRC: “Spiritual Practices as Research Methods: Integrating the Old and New”. what ways are available, generally, for furthering individual awareness. The seven emotional and the seven mental sub-planes could, in other settings, be used for detailed discussion about human development today, each one sub-plane suggesting a specific psychic meaning, well suited for further research. Bio: Bertil Johnsson, Stockholm, Sweden, born 1949, is consultant in organizational & human development, and change leadership, now partly retired. He is an independent researcher in Systemic aspects of Human Integration, Esoteric Astrology, “Symbolic Living”, and paradigmatic issues. He has no specific academic merits, only basic education: MSc studies at the Royal Institute of Technology (KTH); Stockholm (physics, mathematics and electronics/CIT); MScE studies at the University of the Seven Rays, USA, Esoteric Astrology. (Theses for graduating were not finalized, due to dramatic “life events”, but he studied the full curricula. ; many courses/trainings within Psychology – esp. Counselling, Group/Personality Dynamics, and Creativity and Innovation. He taught counselling methods at KTH and the Stockholm University (inhouse training). Private studies in General Systems Theory and History of Science/Physics. He worked within high tech companies, (Ericsson and Nokia, and several SME). Since 1991 a private consultant, working for companies and public health-care bodies. Worked with technology transfer from universities to SME. The proposed presentation will draw on a re-view of my doctoral research into therapeutic space in end of life care. The research focused on specific group projects, developed by the researcher, working in and with nature and imagination and inspired by the quote above. Alongside and within the research process was a resonant experience, of preparing and holding a sacred space in which the research itself took place. This can be examined from three integrated perspectives: firstly, the preparation of myself as researcher, through simple ritual, to engage with the research in an authentic, open and honoring way. The second is the process of choosing, preparing and holding the physical spaces in which the research process took place, (interviewing, exploring, writing) including attention to topography and the ‘felt’ experience of place. The third is found in the method of Intuitive Inquiry which welcomes, encourages and facilitates a spiritual and intuitive engagement with the material and research process. For me, this created space for deepening and compassionate ways of knowing the material, through embodiment and imagination, resulting in a deep and compassionate relationship with the research participants, group participants and the projects themselves. The presentation will refer to a walking meditation created and filmed as a response to the research findings. Bio: Deborah Kelly is an Integrative Arts Psychotherapist, group facilitator and teacher. She has run groups with a variety of foci, such as the wheel of the year, women’s groups, survivors of suicide, five elements and palliative care. Her particular interest lies in working with nature and imagination. She has worked in palliative care for 20 years, as a nurse, shiatsu practitioner, teacher and psychotherapist. She completed a Doctorate in Psychotherapy by Professional Studies at the Metanoia Institute and Middlesex University in London UK, exploring the therapeutic space in palliative care groups. Alongside this she studied with Dr Marie Angelo at Chichester University, in Imaginal Studies. Her research, using Intuitive Inquiry, has led to a deepening interest in embodied and creative ways of knowing in the research process. In this paper, I aim to take one step towards conceptualizing a possible trans-rational peace research methodology through the lens of the researcher. In doing so I commence from the following assumption: while positivist, modern research tries to negate the influence of the researcher on the research topic and is guided by ideals of objectivity and neutrality, postmodern research seeks to problematize the researcher by contextualizing her position in order to make visible unexamined biases and assumptions. In postmodern manner, I too assume that any research conducted in the field of Peace Studies cannot be separated from the researcher’s particular perspective that frames and shapes the research process. I agree with this assumption, yet think it can only be the starting point. I seek to complement the critical stance by adding the perspective of the researcher as a (re)source that can be creatively tapped during the research process. I propose that the researcher is not only a source of biases that need to be made visible and contested, but in transpersonal tradition I see the researcher as both source for and resource during the research process. The paper proposes an affirmative methodology and practice of research that includes and balances the necessary critical positioning as regards the researcher and her engagement with topic and research participants. Conceived in this manner, research becomes experiential. In doing so I conceive knowing in systemic manner through the five gateways of body, heart, mind, soul and spirit. I ask about the ontological, epistemological and ethical premises of such a shift and corresponding (transpersonal) methods. Bio: Norbert Koppensteiner is a peace researcher, based in Innsbruck, Austria. He is Senior Lecturer at the Unit for Peace and Conflict Studies, University of Innsbruck and Program Coordinator at the MA Program for Peace Studies at the same university. He is the author of ‘The Art of the Transpersonal Self’. Research interests include trans-rational peace philosophy, elicited conflict transformation, transpersonal psychology, embodied practices of transformation and research methodologies. Using Narrative Inquiry, this study explores individuation through the lived-experiences of three tribal women healing from trauma. As they collaborated in the creation of a mandala as a spiritual shield, each woman experienced spontaneous transformation, healing and growth. Through the process of ‘remembering’ struggle, these women were restored in new and innovative ways to their creativity and spirituality. Two of these women are qualitative researchers working within the field of transpersonal research and psychology. In this study, one woman explores the research puzzle, considering ways that the research process itself may facilitate self-transformation. Her focus is on personal interaction, in ritual, with the mandala. With art as method, another woman explores the research puzzle of whether art illuminates the researcher’s process of becoming. Her focus is on interpreting the symbols and symbolism of lived experience in the creation of this artwork and making meaning of these experiences. The third woman’s personal experience of transformation as a result of physically working on the mandala will also be discussed. There are multiple ways of becoming. This study highlights the ontology of the evolution of consciousness though the researchers’ shared processes of meaning-making and individuation. Findings contribute to an ethical epistemology implicating the importance of continuous self-reflection and self-mastery among practitioners and researchers of psychology. Bio: Marleen De Villiers, PH.D. is an independent scholar and licensed Psychologist in Private Practice in Cape Town, South Africa, where she works with Transpersonal Psychotherapy and arts-based therapy methods. Her current research interest brings the focus on the process of psychotherapy and the continuous development of the inner life of the psychotherapist. She also pursues an exploration of a dialogue between art and psychology. Marleen is an artist. She works with ceramics and creates jewelry and ceremonial art-pieces in the form of necklaces, which she exhibits and makes available to collectors and buyers world-wide. She also creates mandalas for the purposes of ceremony, healing and rituals. Marleen has presented papers at Eurotas conferences in Greece, (2014) and at the European Congress of Psychology (Milan 2015). She exhibited her jewelry at the Transpersonal Festival in Milan (2015). She took part in the first Transpersonal Research Colloquium in Milan (2015). She took part in the Research Colloquium (2016) in North Hampton, England and also presented a Transpersonal process- workshop at the annual conference of the Transpersonal Division of the British Psychological Association, also in North Hampton, England in 2016. Bio: Jacqui Linder, PhD is a Canadian psychologist specializing in the treatment of complex posttraumatic stress disorder. She is the CEO of a trauma institute in Edmonton, Alberta as well as Clinical Director of a residential treatment facility for sexually abused children. She is also a professor of psychology and the Program Director at City University in Edmonton, Alberta. Jacqui’s research interests include the psychospiritual impact of interpersonal trauma and the victimology of human trafficking. She has presented at a wide range of conferences in Canada, France, Egypt, Greece, Italy, Hungary, the UK, and Guyana. Using the eleven themes of Phenomenological Inquiry (Braud and Anderson 1998), I will focus on my personal spiritual journey raising critical questions as to the validity of experience that change through subsequent reflections. I will present the eleven themes, namely; identifying the vehicles or containers for the experience, discussing emotions and passions, authentic nature, transcending time and space, expansion of boundaries with and without fear, the sense of surrender and its multi levels, insights and a sense of knowing, unconditional love, feeling grateful, ineffability and self-transformation. I will be using pictures, poems, artwork and music in my presentation, sharing how these influenced my research and in particular I will show how journal writing helped me validate experiences. I will also briefly explain the multi levels that emerged through revisiting some of these experiences. Bio: Lindy McMullin has a Master of Science in Transpersonal Psychology and Consciousness Studies and has just completed her PhD in Ancient Greek Myth and Music in Personal, Professional and Transpersonal Development. Lindy is core team member of EDTR, author of “A Soul’s Journey” and one of the co-editors of the book Metamorphosis through Conscious Living that emerged from the 16th EUROTAS conference in Crete 2014. Lindy was director of the conference that brought the three main transpersonal organizations of ITA, ATP and EUROTAS together for the first time in 2014, and currently edits the EUROTAS newsletter. Lindy is based in Athens, Greece where she is in private practice as a EUROTAS certified Transpersonal Psychotherapist, lecturer and workshop leader. Embodied, empathic, and imaginal resonance have served a similar, integrative function as ways of intuitive knowing in the process of my spiritual development and pursuit of qualitative inquiry. I have valued knowing through the body, heart, and the imagination as counterpoints to reason in subjective response to lived experience, my own and others. These three receptive-perceptive modes of resonance are transformative in that they challenge preconceived ideas while complementing rational attitudes toward interpretation and meaning making. Resonance is inherent to the physics and biophysics of our universe. It denotes an attraction, identification or sympathetic relationship in response to others, which is evocative of similar qualities, shared between two or more entities. Resonance is a vehicle of information that amplifies perceptions and behavior, which are then inherited and reinforced through responsive adaptation (Sheldrake, 1987). It is reflected in synchronicity, entrainment, but also dissonance (Heron, 1992), and is influenced by verbal and nonverbal correspondence (Netzer, 2013). In spiritual development, resonance honors inner knowing and cultivates compassion; in research, resonance entails maintaining authenticity while expanding oneself through an intersubjective reflexive process. However, for reflexivity to be transcendent (rather than merely self-affirming), we must risk discomfort (Pillow, 2003) as it sheds light on the fragile process of inquiry as lived experience. Attunement to sensed, felt, and image-based resonance has often lead me to awareness of unanticipated purpose in my research and everyday life that transpired spontaneously through reflexive engagement and intimate connection with my new understanding. One lens for describing this approach is Jung’s concept of aesthetic animation (Jung, 1957/1983), as it pertains to projection of archetypal meaning on creative experience in introverted or extraverted manners. In this TRC presentation, I intend to briefly outline the nature of the three modes of resonance and their application in qualitative inquiry and as a spiritual practice. I will then address how through reflexive consideration of one’s initial resonance in terms of aesthetic animation, one can become aware of the potential and limitations of resonance, as well as the importance of validating the merit and relevance of discoveries through transparent communication of the inquiry process. Bio: Dort Netzer is an art therapist in private practiceimaginalresonance.org. She works with children, adults, couples, and families, with a focus on healing as a spiritually oriented, creative development. In addition to her therapy practice, she is an adjunct research faculty at Sofia University, CA and an assistant adjunct professor of Creative Art Therapy at Hofstra University, NY. In her approach to therapy, education, and research Dorit incorporates creative expression and other imaginal modalities, such as mental imagery and dream work. Dorit has published on the role of creative expression in healing, research, and transformative education hofstra.academia.edu/DoritNetzer. She is a co-founder of the Transpersonal Alliance itpalliance.org and contributor to the Sacred Science Arts-based Research Archive sacredsciencecircle.org. This paper discusses the impact of transformative process on the researcher when carrying out studies employing transpersonal research methods. It draws from my personal experience of researching Tibetan Buddhists’ understanding of crisis and development at the spiritual level, in particular, the depression I experienced at the stage of data analysis. Transpersonal research methods aim not only to reach the depth of understanding of the human experience being explored but also to transform both participants and researcher along the way. In designing research which employ such methods, the researcher’s own familiarity with, and a deep interest in, the transpersonal play a crucial role. Furthermore, this interest that the researcher brings to the research leaves her emotionally open to research data, for example, experience narrated by participants. As a researcher ‘inhabit[s] the lived world of’ a participant, it brings her a deep understanding of the participant’s experience (Anderson, 2011). While this is an intended outcome of her engagement, it may also lead her to a door opening onto unknown regions of her own psyche. As was the case with my own research, this may become a potential ‘issue’ when the transpersonal experience under investigation involves traumatic and/or nadir experiences rather than peak experiences. Why would a repeated and intense engagement with a narrative of traumatic experience trigger an experience of psychological crisis in the researcher? The mechanism behind this may be explained by the concept of systems of condensed experience (COEX) of Stan Grof. The research process taps into a cluster of resonating experiences in the researcher’s unconscious and possibly further into the collective unconscious, which may include a deep wound that she had not been fully conscious of. When this happens, how far and deep should the researcher explore? What can the researcher do in order to remain insightful and sensitive to the experience/narrative under study yet also to retain psychological balance and integrity without having it disrupt the research process? Focusing on this question, I will compare my practice of intuitive inquiry as originally designed by Rosemarie Anderson, with Vipassana meditation, a systematic body scanning technique, as taught by the Buddhist meditation teacher, S. N. Goenka. Bio: Unjyn holds a PhD in psychology from Leeds Beckett University in UK (2016). Her PhD research centers on giving voice to lived experience of indigenous Buddhists and their individual interaction with Buddhism. Her research project originated from her experience of living amongst Tibetan refugees for years and draws on Buddhist history and doctrinal studies, contemporary qualitative research methods, and transpersonal theories. Since her PhD, she has been teaching Buddhism in FPMT Tibetan Buddhist centre and Manchester University, UK. Her research interests are individual and collective spiritual crisis, individuation, traditional spiritualities in postmodern context, and multicultural research methods. The social persona in China, configured to ensure communal harmony and protocol in relationships, had for almost twenty CE centuries been a Confucian venue for cultivating virtue. The quality and level of engagement, of course, depended on the individual. Mostly, people simply lived the persona as deep-rooted tradition and expected familiar, stable norms of mutual respect, trust, kindness, helpfulness, reciprocity and smiling eyes in social interaction. Reversing this outcropping in persona to track its source, the seeker or researcher can eventually expose a spiritual hotbed to which families of virtue are wired. The practice of persona in collective life, thus, serves to hold ground to manifest Spirit, while the meditation on such persona can be a researcher’s own tool to discover and pivot on Spirit. in resting at ultimate good. This Luminescence appears to be key to understanding ourselves as individuals-in-a-collective. Its psychic scaffold works like a compass: Leg A as pivot, Leg B circling in the collective, and a handle (C) hinging the two. The AC-shaft connects the Luminescence. From the Analects, the opening passage trains the researcher on immanence of self-and-collective in the Luminescence. Its three “sayings” all evoke happiness accessed by pivoting on the Luminescence. A1:01c—accessed upon undoing psychological blocks. “When you no longer fret at people ignoring you, would you not be self-actualizing?” By recognizing obstruction and repositioning the pivot point, the psyche ungags the Luminescence. The researcher now recovers the genuine self for social interaction. The researcher here ingrains two basic responsibilities to fathom the gist of psyche: (1) to self-reflect and practice to habituate a technique and (2) to uncover one’s original—Luminous—mind to bond with one another through the mutuality of trust and love. Bio: Born of Chinese parents in China, but raised and educated in English in India, Japan and the U.S., my biculturalism has steered me to integrate East and West in myself and in my work. I am now inviting parallel ideas and practices of Confucius into dialogue in the transpersonal matrix. My education includes MA–English and Education, Columbia University; PhD–integral psychology, California Institute of Integral Studies, San Francisco; many programs in integrative psychology; and 5 years of Jungian studies and analysis. I have presented and taught workshops on world literature in 20+ US cities and on Confucius’ psychology in the U.S., China and Europe. In world literature, I have created curriculum, taught, presented, contributed to textbooks and represented the State of New York at National Teachers Forums. Currently I am an independent scholar and researcher. On Confucius I have published The Great Learning: Confucius’ implicit integral psychology of individuation amplified through Jung and Aurobindo (1998 Dis. ); The heart-mind fusion (2010); Confucius, septuagenarian (2011); Confucius, mediator (2012); Confucius on psychological peace and joy (2014); Confucius A-Z: A psychological exploration, 2nd ed (2015). See “Confucius’ Hermeneutical Archive” at www.SacredScienceCircle.org. In Plato’s Phaedo, Socrates remarks that “True philosophers make dying their profession.” What implications does this quote have for Transpersonal researchers? Alchemical emblems from the Rosarium Philosophorum or the Rosary of the Philosophers (1550) provide a way of exploring responses to this question. This presentation will link woodcuts from the Rosarium series to research on spiritual or religious experience in dreams. Melinda is Director and Co-founder of the Dream Research Institute, London. She has served as past Vice President of the International Association for the Study of Dreams. Her writings on dreams have appeared in a variety of publications. She also works as a registered psychotherapist and teaches lucid dreaming. Melinda has undertaken doctoral research on the subject of spiritual or religious experiences in dreams with Christ Church Canterbury’s Professional Development Foundation and the Alef Trust, UK. “Let it be known: Today the Eternal Feminine in an incorruptible body is descending to Earth. In the unfading light of the new goddess Heaven has become one with the deeps”. (Bulgakov 1993: vii, qtd. Solovyov). Through women’s narratives of mystical experiences with the Divine Feminine, this paper demonstrates the creation and manifestation of personal and collective balance and wellbeing into the world. The women at the center of the paper are their transpersonal practices of contemplation in various forms and report their mystical experiences, which, as a consequence, bring them in touch with a wider awareness of higher worlds, their feminine identity, sexuality, and life purpose in their current reality. These experiences generate a sense of well- being, enlightenment, and empowerment, which is then demonstrated in their personal lives and on the broader world stage. The works of authors Carol Christ, Rudolph Steiner, and Vladimir Solovyov inform the paper as well. The paper reports these women’s experiences, quoting the revelations they received in narrative form. Their narratives bring into being their own imaginal, embodied relationship with the Divine Feminine. This form of direct knowing is the ‘soul of the work’ (Romanyshan 2017:39, 213, 216). It demonstrates a transpersonal methodology created through contemplative practice. Such practices include the personal intention to connect with the Divine Feminine that is brought into consciousness through meditation, guided imagery, Celtic ritual, dream work and journal writing, to name several modalities. The women chose which practices were best suited for them as passages to deeper self-awareness. Some reported spontaneous, mystical experiences, which were then sustained by some of the above practices. This paper establishes that an alchemical transpersonal narrative methodology transcends quantification, definition, or empirical analytical criticism, because it interacts with women’s own voices, narratives, and observations of positive, empowered change that manifest the results of the study. In a time when women’s mystical experiences are gaining more traction and attention, this paper creates a doorway to a methodological approach that offers both the transparency and depth necessary for understanding and embracing women’s experiences of the Divine Feminine. Bio: Laura Sherman is a psychotherapist implementing an amalgamation of Jungian and Transpersonal approaches to client-centred therapy. Her published works include the book, “There’s a New Family in My House” (Shaw, 1993) and a research paper, ‘Finding the Divine Feminine in Current-day Ireland: A Return to the Great Mother’ (Alternative Spiritualities Conference, Maynooth University, Dublin, 2007). She lives in the South of France and is currently conducting research focusing on women’s mystical experiences of the divine feminine and women’s personal experience simply melting an auto-ethnographic perspective in the tradition of Ellis, Romanyshan, Braud and Anderson. She holds both a Master of Science in Counselling Psychology and a Masters of Arts in Spirituality by research. Her studies have included the yearlong development of a contemplative psychotherapy group model and a practice of contemplative prayer at a Benedictine Monastery in Minnesota. In addition, she has studied weekly with a Buddhist Rinpoche in temple sittings in Chicago, Illinois. Her career path includes guest lecturing at Loyola University in Chicago, Il, (2006-2007) and The Milltown Institute in Spirituality, Dublin, Ireland (2010). Currently, due to her travels and research, her client work has centered on spiritual direction and esoteric practices. She is currently working with an editor and filmmaker in Paris transforming her Master’s thesis into book and documentary form on women’s mystical experiences of the Divine Feminine. Her approach to research method, counselling, and lecturing focuses on spiritual and transpersonal experience implementing story, narrative, and autobiography resulting in personal and collective transformation. This presentation begins from a Qi-based theoretical premise (Tze, 2014), and considers the prospect that all phenomena, whether gross (material) or subtle (energetic, psychic), participates in the same unified, implicate and participatory landscape (cf. Bohm, 1980; Ferrer, 2002). Against this backdrop, it considers so-called subtle phenomena such as biofield therapies (Rubik, 2002), placebo effects (Crane, 2016), and spiritual healing, and asks how such transpersonal events might be more systematically measured and understood. In order to proceed on in such terrain with any degree of sophistication, however, it becomes necessary to highlight the role that a given observer or researcher inevitably plays in affecting such measurements (cf. Heron, 2002). This in turn brings forward the significance of meaning-making in an integrative, participatory universe, and requires that we take seriously and carefully examine the relationship between meaning and matter. Finally, the meaning-making process invokes the time function and makes synchronicity, or the synchronic moment of ascertainment for a given phenomenal coalescence, whether individual or interpersonal, a potentially crucial factor to consider in measuring subtle phenomena. With such a viewpoint in hand, we can consider a participatory, cooperative inquiry aimed at measuring subtle phenomena, for example measuring the substantive and/or energetic dimension of thoughts. We can also look at the co-creative meaning-making apparatus itself, and design research protocol to measure or even enhance the experience of synchronicity. Such research projects, it is argued, could generate valuable data to better inform transpersonal understanding and theory, as well as offer possible avenues to enhancement in life experience and well-being. At this stage, such proposals are essentially sketches; one goal of the presentation would be to stimulate conversation and analysis and to harness the collective wisdom of the colloquium to help advance such efforts more substantially. it will be argued that ESI is particularly well suited to address psychospiritual, intersubjective, and transpersonal topics. As a complement to Jorge Ferrer’s theoretical presentation of the approach, this presentation will share the specific research process utilized in an ESI that took place within a graduate course at the California Institute of Integral Studies in 2013. The presenter—who was a co-inquirer and first author on the report of this inquiry, as well as teaching assistant on subsequent inquiries—will discuss all stages of the research process: from initiating the inquiry and building a sense of community amongst co-inquirers; to selecting the inquiry topic and engaging in inquiry activities; to data collection, analysis, and reporting. To demonstrate the potential fruits of ESI, the key outcomes of the inquiry will be summarized, including both the informative and transformative dimensions (i.e., not only what we learned, but also how we were impacted by our involvement in the research). In addition, the presenter will share highlights from her own experience as a participant in ESI, offering an inside perspective on the value of this approach for transpersonal research. Bio: Olga R. Sohmer, MA, PhDc., is an experiential educator and counselor passionate about exploring the contours of the human body, mind, heart, soul, and spirit. She coauthored the chapter “Embodied Spiritual Inquiry: A Radical Approach to Second-Person Contemplative Education” in the forthcoming anthology, The Intersubjective Turn in Contemplative Education: Shared Approaches for Contemplative Learning and Inquiry Across Disciplines (Ferrer &Sohmer, edited by Gunnlaugson, Sarath, Bai & Scott, SUNY Press). She is also the first author of an Embodied Spiritual Inquiry (ESI) exploring the nature of human boundaries (forthcoming), and guest editor for a forthcoming special issue of the International Journal of Transpersonal Studies focused on participatory research approaches to engage transpersonal topics. Her interests include embodied spirituality, transpersonal psychology, expanded states of consciousness, archetypal cosmology, and participatory research. Olga currently assists ESI graduate courses and is working on her doctorate in East West Psychology at the California Institute of Integral Studies. Born in Russia, Olga now resides in California with her husband and one-year-old son. Through her work and daily life, she hopes to contribute to healing the way human beings relate to ourselves, each other and the Earth, our home. In June 2016, the United Kingdom voted to leave the European Union after a campaign fought upon the premise that the continued arrival of the migrant other was a threat to the stability and the finances of the nation. This shift marked a change in the political landscape across Europe and the United States, and the West has witnessed a marked movement towards the right ever since. This research asserts that we all have an experience of being other. It also sees the experience of being stereotyped, objectified, or othered as not only an extremely painful one, but as also potentially damaging both psychologically and spiritually. A phenomenological research project, this research used creative techniques common to Transpersonal psychotherapy, such as meditation, visualizations and drawing to explore the internalized experience of being made the other by the majority. Underpinned by the work of Merleau-Ponty, this project followed Moustakas’ stages for Phenomenological research. This involved interviewing 25 participants about their own experience of being the other. During the interview, each participant was invited to meditate upon one of these aforementioned experiences. They were then asked to locate this experience in their body, before then visualizing an image that represented the felt experience of being the other. The images were then drawn and photographed, so they could be analyzed alongside the rest of the interview, again following Moustakas’ research methodology. The phenomenological thematic analysis of the participant’s interviews and drawings yielded many varying themes. For this conference presentation though the idea that we unconsciously destroy that which makes us other so as to fit in with the majority was primary, leading to the death of that which makes us Other. Bio: Dr. Dwight Turner completed his PhD through the University of Northampton & the Centre for Counselling and Psychotherapy Education (CCPE) in 2017. His phenomenological and heuristic research project, entitled ‘Being the Other: A transpersonal exploration of the meaning of human difference’ utilized creative techniques such as meditation, visualizations, drawing and sand play work to consider the unconscious and internalized experiences of difference &of being the Other. Professionally Dwight is Senior Lecturer within the School of Applied Social Sciences at the University of Brighton, in the United Kingdom, where he lectures on their Psychodynamic PG Dip and MSc courses in Counselling and Psychotherapy. He is a part-time lecturer, supervisor and tutor for the PGDip, MA and Supervision courses at the Centre for Counselling and Psychotherapy (CCPE), in London. Finally, and is also a psychotherapist and supervisor in private practice in London. In this presentation, I will be talking about methodological frameworks for integrative research derived from ancient philosophy and early Christianity. In particular, the idea of a fourfold process of understanding which begins at a literal level and opens into a mystical or transpersonal dimension, via the symbolic, known as ‘the four senses of interpretation’ by the Fathers of the Western Church. A similar fourfold process is also found in Judaism, neoplatonic philosophy, and various esoteric disciplines such as alchemy and Kabballah, and these hermeneutic methods can ultimately be seen to arise from Pythagorean and Platonic metaphysical and epistemological premises regarding the nature of the human soul. In my view, these metaphorical framings for a journey of ‘consciousness raising’ through reading or contemplating source material we might term ‘archetypal’, can be used to great effect in research and teaching, particularly in transformative learning contexts. They offer a holistic model which heals the split we have suffered over the past four hundred years (in the West) between sense perception, objectivity and deep intuition, and cultivate an awareness of what Iain Mc Gilchrist (2009) would term the appropriate relationship between right and left hemisphere modes of knowing. I will explain how we use these methods in the classroom on our MA program in Canterbury, UK on Myth, Cosmology and the Sacred and how they might constitute an integral methodology of the imagination for the research process, reinvented for our times. Bio: Angela Voss PhD, SFHEA is Senior Lecturer in the School of Childhood and Education Sciences at Canterbury Christ Church University, UK, where she is the program director the MA in Myth, Cosmology and the Sacred. Originally trained as a musician and astrologer, she has published extensively on the astrological music therapy of the Renaissance philosopher Marsilio Ficino and the role of the symbolic imagination in Western esoteric traditions. Now she is concerned with building bridges between wisdom traditions and transformative learning contexts. Her latest book, co-edited with Simon Wilson, is Re-enchanting the Academy (Rubedo Press, 2017), a collection of essays about ways of integrating imagination into academic learning and teaching. She would describe herself as a walker between the worlds of esoteric wisdom, symbolic practice and scholarship. Yogic chakra meditation as a spiritual practice may also be viewed as a contemplative research technique which investigates the expansion or contraction of consciousness as a heuristic research method. The expansion of consciousness may take places as a gradual process of psychic and spiritual awakening (i.e., spiritual emergence), or as a sudden and powerful surge of energy and insights (i.e., spiritual emergency; Kundalini awakening). The reversible or irreversible contraction of consciousness may happen as a result of negative experiences (i.e., trauma, fear, sadness, anger). The mortality salience, which can be more broadly defined as any kind of existential threat to individual’s sense of security (i.e., fear), can act as a trigger for both “nurture” and “nature” to get activated. At the same time, it induces either a progression of consciousness from one subtle energy level to another, or its regression and contraction. This mortality awareness can range from the experiences of direct encounter with death, traumatic experiences, to the feelings of being threatened. We will examine the positive and negative aspects of chakras as a part of a subtle energy system which constitutes the foundation of yoga as a spiritual discipline. The process of consciousness expansion via a greater mortality awareness i.e., mortality awareness consciousness expansion (MACE) hypothesis follows the trajectory of the Kundalini awakening. The specific topic discussed includes the effect that the fear of death has on either awakening (positive) or regressive blockage (negative aspect) of the first three lower chakras, which according to C.G. Jung dwell in different domains of consciousness (the unconscious, the preconscious, and the conscious). For example, the excessive activation of the first root chakra triggered by the fear of death leads to denouncing the unfamiliar worldviews (the negative aspect). The heuristic aspect of this research is based on the integration of subjective experiences of the researcher (e.g. chakra meditation), current neurocognitive findings, several case studies of people exposed to mortality salience, and some theoretical premises of transpersonal psychology. Bio: Milica Zegarac was born and raised in Belgrade, Serbia, but spent the second half of her life in the U.S. Initially with a business background (MBA, University of Illinois) and many years spent in investment and marketing in the U.S., she eventually ventured into “different waters” to pursue her long-standing interest in the transpersonal. She has a Master of Arts in Transpersonal Psychology from Sofia University (USA) and is in the 4th year of their Ph.D. in Psychology program (Consciousness and creativity concentration). She is a presenter at international conferences with topics related to consciousness exploration (TSC, by University of Arizona, San Diego 2017), Community Psychology (6th ICCP, Durban 2016), and Transpersonal Psychology (EUROTAS; Romania 2016; Italy 2015; and Greece 2014). She is a certified yoga instructor (RYT-500, India), and explorer of spiritual healing (Brazil), as well as trained in Pranic Healing and life coaching (ACISTE). Her main interests are in transpersonal and somatic psychotherapies with breath and movement as modalities, and their role in healing trauma and mood disorders. 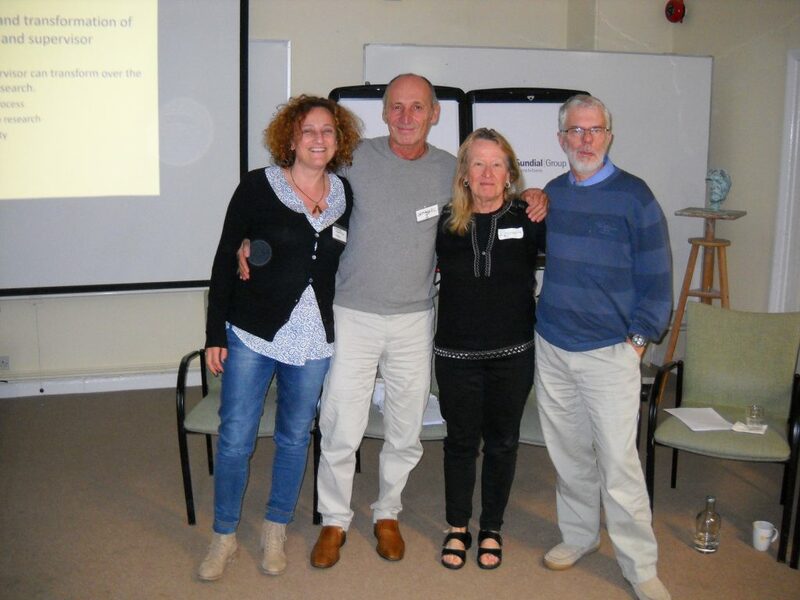 The Second Transpersonal Research Colloquium will be organized and facilitated by the four co-founders of the TRN together with members of the Transpersonal Section of the British Psychological Society, who will host this TRC. TRC 2016 will take place near London in September 2016 in conjunction with the annual conference of the British Psychological Society (BPS), Section of Transpersonal Psychology. The First Transpersonal Research Colloquium (1. 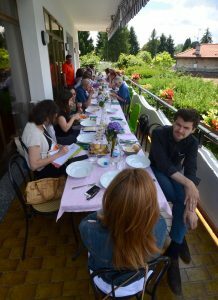 TRC) took place at Lake Orta in northern Italy in June 2015, following the EUROTAS Festival. The colloquium was organized by Drs. Pier Luigi Lattuada of the Integral Transpersonal Institute (www.integraltranspersonal.com), Rosemarie Anderson of Transpersonal Consultancy (www.transpersonalconsultancy.com) and Giovanna Calabrese and Regina U. Hess representing the EUROTAS Division of Transpersonal Research (http://eurotas.org/division-of-transpersonal-research-edtr/). Facilitators introduced their specific research interests. Pier Luigi Lattuada discussed research from an epistemological perspective speaking about his vision of Second Attention Epistemology; Rosemarie Anderson overviewed transpersonal research as encounters with the Sacred open to personal and cultural transformation; Giovanna Calabrese considered the importance of a transpersonal perspective on evidence-based practice; Regina Hess spoke about embodied phenomenology and embodied aesthetic interpretation. 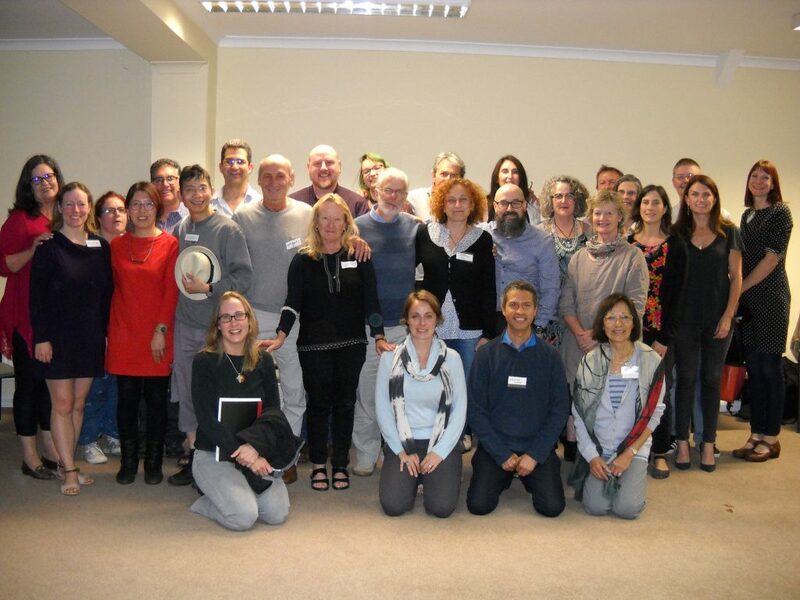 Twenty-seven participants from Europe, North America, and South Africa shared their experiences in research using a range of methods to explore different areas of transpersonal, spiritual, and related topics. 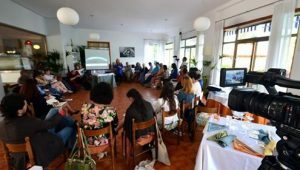 The facilitators and the participants engaged in stimulating dialogue including transpersonal approaches to research and epistemological considerations from scientific and philosophical perspectives. Different research approaches were considered, including ways to combine qualitative and quantitative methods effectively, hermeneutical methods and intuitive inquiry, narrative and embodied art-based approaches to research, as they are applied in different fields from clinical to social and personal development. What emerged from the different discussions is the involvement of the researcher in the research journey, from the first arising of the research question through the disclosing of the philosophical implications, which in turn guide the choice of the method, data collection and analysis. Ethical issues were also considered, as intimate and private experiences are often the focus of the research and personal disclosure and sharing has to be considered with particular respect and attention. Hi, you can send us an email and we'll get back to you, asap.